Grow awesome gardens with this great new product. It is 100% organic and contains everything your plants need to be beautiful, strong and healthy. Raised bed gardening is rapidly growing in popularity, as an easy and effective way to grow all types of plants with the ease of accessibility. 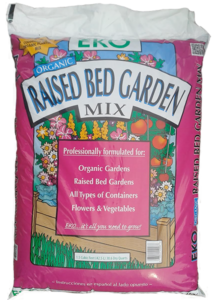 EKO Raised Bed Mix is the ideal product for vegetables, flowers, herbs and any type of plant that you would grow in a raised bed.